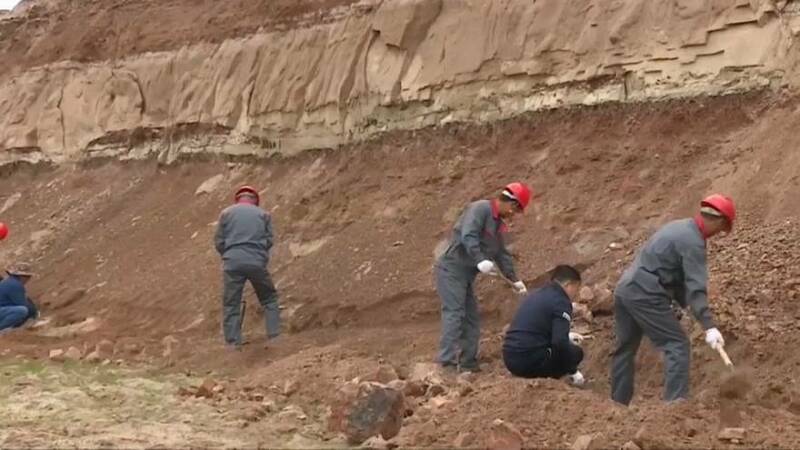 The Chinese Academy of Sciences (CAS) launched Friday an excavation of a large-scale dinosaur-fossil group, the only one of which in the world that has been found in a modern urban area. Located in Yanji city, northeast China’s Jilin Province, the fossil group is expected to cover an area of 10 square kilometers. It is also the city’s first discovery of dinosaur fossils. Experts from the CAS say that the geologic body at the excavation site with its differently colored layers suggests that the climate of that era indicates that it may have formed between the late early Cretaceous and early late Cretaceous geological period about 100 million years ago. “We can see that the geological layers show different colors including red, purplish red and light colors. The geological layer with the color of purplish red means that, when the layer was formed, the dinosaurs lived in a hot and humid climate. And the layers with light colors were formed during periods with dry and cold weather. We are basically sure that the geologic body here was formed between the late early Cretaceous and early late Cretaceous,” said Zhang Lizhao, a researcher with the Institute of Vertebrate Paleontology and Paleoanthropology of the CAS. Zhang said there were about six types of dinosaurs living in the area during the period, also noting on the relatively well-preserved condition of the fossils. “This is a dorsal vertebra section of a dinosaur, and this fossa connected another section of the dorsal vertebra. And this is part of a dinosaur’s caudal vertebra, with two sections still linking together. Normally two vertebrae of a dinosaur fossil are no longer connected, so this one is in a better condition,” Zhang said.